In the Fall of 2017, CPA Director Paul Heidebrecht will once again be teaching a special topics course in Peace and Conflict Studies on Engineering and Peace. 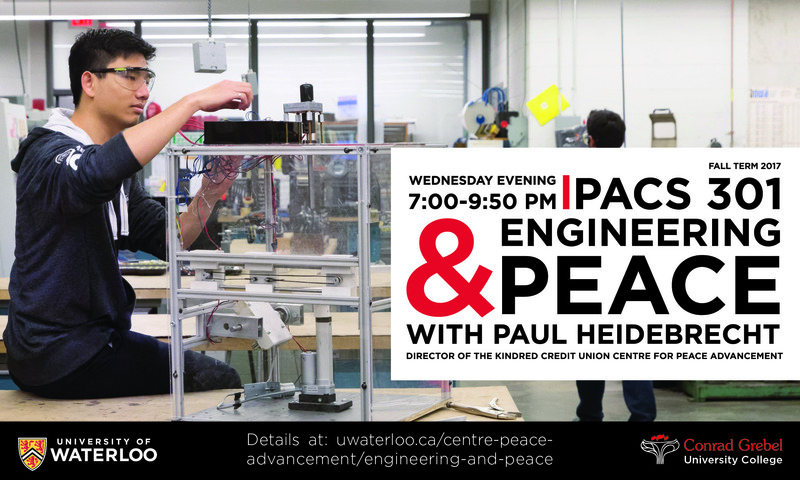 Meeting weekly on Wednesday evenings, this course is built on the conviction that the kinds of problems engineers seek to address, and the ways they seek to address them, should matter for anyone interested in advancing peace in the world. "This course put my work as an engineer in context! I think that by taking this course, I grew both as an engineer and as a person." Doing your co-op term with the CPA this Fall is the perfect way to enter into the professional world, to network, and to skill-build, without even having to leave campus! The Kindred Credit Union Centre for Peace Advancement (CPA) has hired co-op students each year since 2014, and we’ve had great experiences. This year, the CPA co-op role focuses primarily on executing communications support.